Plant that concentrates solar radiation to reach very high temperatures (over 3,000°C) as part of a research effort to develop experimental materials (including astronautic materials and ceramics). Heliostats: remote-controlled adjustable mirrors that follow the Sun’s trajectory and concentrate solar radiation toward the boiler at the top of the tower. Structure atop which the furnace is placed to collect luminous energy; it usually reaches a height of 20 m.
Point where solar rays reflected by the parabolic mirror converge. 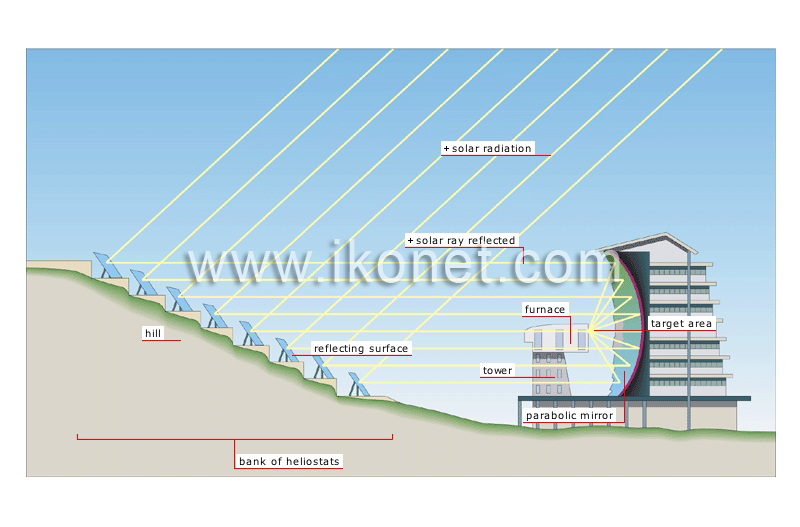 Heliostats are placed on slopes to prevent energy loss due to shade or the interception of reflected rays by neighboring mirrors. Reaching temperatures of over 3,000°C, it is mainly used to process and develop materials. Curved mirror that concentrates the Sun’s rays toward one point in the furnace (the target area). Polished metallized glass that receives solar radiation and direct it to the parabolic mirror. Solar rays that reach the heliostats are sent to the parabolic mirror. All the electromagnetic waves emitted by the Sun.